Transportation Services is tapping existing bus drivers to serve as department ambassadors tasked with recruiting fellow bus drivers and encouraging them to join their ranks. 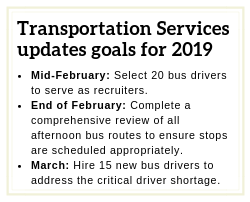 The 20-member internal recruiting team will be established by mid-February, Transportation Services General Manager John Wilcots IV said. The hand-picked team will work on recruitment each day after they complete their routes. Recruitment duties will include attending job fairs and other recruitment events and posting recruitment fliers in areas with high traffic, such as libraries, beauty shops, and restaurants. “They’re the best people to go out there and tell others about their jobs and really sell Transportation Services,” Wilcots said. Transportation Services, like many transit organizations, is facing a critical driver shortage. Creation of the new team is one in a series of strategies designed to address the issue. The department also is continuing efforts to increase efficiency and streamline operations through the reduction of unnecessary routes, which, in turn, reduces the number of new drivers needed. The department is operating 820 routes as of this week, 40 routes fewer than they did at the start of the spring semester. Almost five percent of routes have been decreased, which has resulted in fewer buses arriving late to school each morning and fewer complaints filed by parents. In the past month, Transportation Services has hired seven new drivers and three more are going through the hiring process. Wilcots said he hopes to hire a total of 15 new drivers by March. Once Wilcots makes that goal, he will only need 50 to 75 additional drivers. But, Wilcots said, he won’t stop there. “I’m still going to go for 100 new drivers as a good cushion,” Wilcots said. This entry was posted in Business Operations, News, Transportation and tagged Transportation Services on February 7, 2019 by HISD Communications.